852553 Magnet Set Stormtrooper, Rebel pilot and AT-ST Driver is a magnet set containing a Stormtrooper, a Rebel Pilot and an AT-ST Pilot released in 2009. Included are three magnet bricks and three guns for the figures. This is a description taken from LEGO.com. Please do not modify it. Heroes and villains of Star Wars do battle on your fridge! 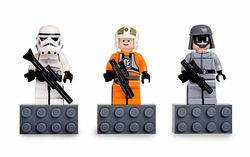 Authentic LEGO Star Wars minifigures of a Rebel Y-wing Pilot, Imperial Stormtrooper and AT-ST Driver include accessories and magnets to let them attach to your fridge and other metal surfaces! Facts about "852553 Magnet Set Stormtrooper, Rebel Pilot and AT-ST Driver"
Heroes and villains of Star Wars do battle on your fridge! Authentic LEGO Star Wars minifigures of a Rebel Y-wing Pilot, Imperial Stormtrooper and AT-ST Driver include accessories and magnets to let them attach to your fridge and other metal surfaces! This page was last edited on 9 February 2019, at 23:15.